What do you mean you don’t like jazz? It just means that when I listen to it, I don’t like it. The most candid of responses, mixed with sweetness and optimism. That’s the kind of movie you can really get behind, you know? The kind that will propel film into the 21st century and get us out of our hum drum lives, the lives we need to escape from after the great war. Just kidding, this movie happened in 2016, and it’s about the future. I’ve written about American director Damien Chazelle before, when I decided to review Whiplash last August. So yeah, we already know that Chazelle is a musical whiz, and that he can bring music and film to life in an epic pairing. Owed to his own musical background of course. Which he fully and completely does with the construction of 2016’s La La Land. Here is a brief overview of the plot, courtesy of Wikipedia. Stuck in traffic on a Los Angeles highway (“Another Day of Sun”), Mia Dolan (Emma Stone), an aspiring actress, has a moment of road rage with Sebastian Wilder (Ryan Gosling), a struggling jazz pianist. Her subsequent audition goes poorly, where the casting director takes a call in the middle of an emotional scene. That night, Mia’s roommates take her to a lavish party in the Hollywood Hills (“Someone in the Crowd”). She walks home after her car is towed. During a gig at a restaurant, Sebastian slips into a passionate jazz improvisation despite warnings from the owner (J. K. Simmons) to stick to the setlist of traditional Christmas songs. Mia overhears the music as she passes by (“Mia and Sebastian’s Theme”). Moved, she enters the restaurant, but Sebastian is fired. As he storms out, Mia attempts to compliment him, but he brushes her off. Months later, Mia runs into Sebastian at a party where he plays in a 1980s pop cover band; she teases him by requesting “I Ran (So Far Away)”, a song he considers an insult for “a serious musician”. After the gig, the two walk to their cars, lamenting each other’s company despite the chemistry between them (“A Lovely Night”). The next day, Sebastian arrives at Mia’s work, and she shows Sebastian around the movie lot, where she works as a barista, while explaining her passion for acting. Sebastian takes Mia to a jazz club, describing his passion for jazz and desire to open his own club. They warm up to each other (“City of Stars”). Sebastian invites Mia to a screening of Rebel Without a Cause; Mia accepts, forgetting a commitment with her current boyfriend. Bored with the double date with her boyfriend, she runs to the theater, finding Sebastian as the film begins. The two conclude their evening with a romantic dance at the Griffith Observatory (“Planetarium”). After more failed auditions, Mia decides, at Sebastian’s suggestion, to write a one-woman play. Sebastian begins to perform regularly at a jazz club (“Summer Montage”), and the two move in together. Sebastian’s former classmate Keith (John Legend) invites him to be the keyboardist in his fusion jazz band, where he will be offered a steady income. Although dismayed by the band’s pop style, Sebastian signs after overhearing Mia trying to convince her mother that Sebastian is working on his career. Mia attends one of their concerts (“Start a Fire”) but is disturbed, knowing Sebastian does not enjoy his band’s music. During the band’s first tour, Mia and Sebastian get into an argument; she accuses him of abandoning his dreams, while he claims she liked him more when he was unsuccessful. Mia leaves, insulted and frustrated. Sebastian misses Mia’s play due to a photo shoot with the band that he had forgotten. The play is a disaster; few people attend, and Mia overhears dismissive comments. Despondent and unable to pay the theater back, she moves back home to Boulder City, Nevada. Sebastian receives a call from a casting director who attended Mia’s play, inviting her to a film audition. Sebastian drives to Boulder City and persuades Mia to attend. The casting directors ask Mia to tell a story; she sings about her aunt who inspired her to pursue acting (“Audition (The Fools Who Dream)”). Sebastian encourages her to devote herself to the opportunity. They profess they will always love each other but are uncertain of their future. Five years later, Mia is a famous actress and happily married to another man (Tom Everett Scott), with whom she has a daughter. One night, the couple stumbles upon a jazz bar. Noticing the “Seb’s” logo she had once designed, Mia realizes Sebastian has opened his club. As Sebastian notices Mia in the crowd, he plays their love theme and the two imagine what might have been had their relationship worked perfectly (“Epilogue”). Before Mia leaves with her husband, she shares a smile with Sebastian. What a whirlwind! I’ve seen this movie three times now, and I still can’t but smile when I think about it. Gosling and Stone have some of the best chemistry of all time, better than Ethan Hawke and Julie Delpy, Clarke Gable and Vivien Leigh, Meg Ryan and Billy Crystal, Katherine Hepburn and Cary Grant, Jennifer Lawrence and Bradley Cooper. I could go on for a while. Point being, that while this appears to be a film about Hollywood, it’s moreso a film about love and the dangers of it, but despite those dangers, it’s far better to experience love and live a full life than to wait for life to happen. Pros: The two leads play well off of each other, as they always do. Stone is beautiful and heartbreaking in her authenticity, and Gosling is too warm hearted to really be that rakish. The homage to the passage of time is so well done you’ll get all the feels. Cons: There are an ever-present string of cliches to snip through as you watch, but you have to know the musicals that came before to be truly effected by it. Points of Interest: Emma Watson turned down this role to film the live adaptation of Beauty and the Beast. Ryan Gosling learned to play piano for this role, and John Legend learned to play guitar. This is a love affair fully realized, passing through seasons, time and space, and ending on a high note. No, it is not a happily ever after scenario, but La La Land doesn’t need to be in order to showcase the starry idealism of today’s youth. Talented and romantic, these kids are paying homage to what has proceeded them, without falling into the tropes of the musical genre. 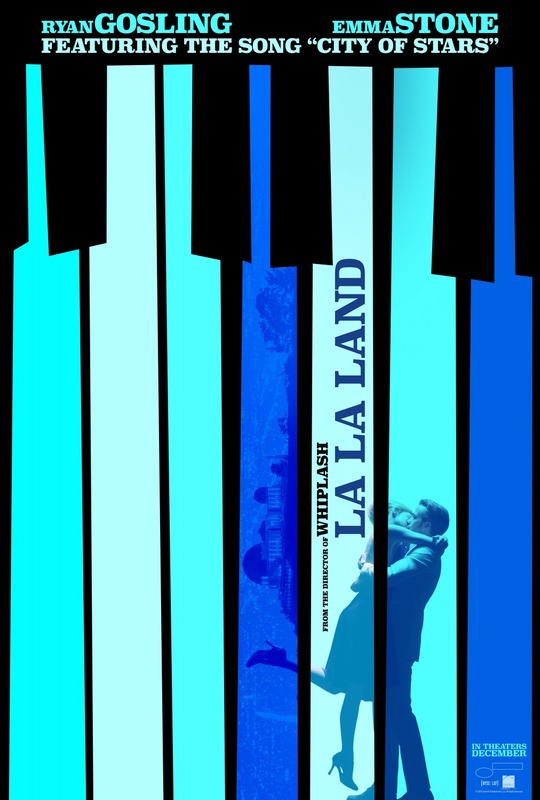 Admittedly, I struggled with the very first sequence of the film, but I think like any good musical, Chazelle is capable of drawing you into this world and getting you to settle into it’s rules. There are musical numbers throughout this love story, but what I find most interesting of all is the love story that Chazelle has with this city. La La Land is so happy and sweet in it’s outpouring of emotion, that you have to wonder what Los Angeles did right to have this director fall so hard for her. I have a few theories, but I don’t kiss and tell.